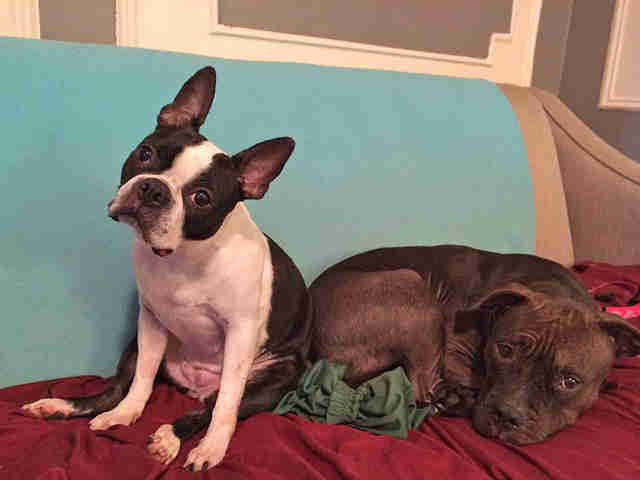 When Chowda was first rescued from an abusive and neglectful home, the little black and white dog was dramatically underweight and under-socialized. She cowered in fear whenever someone new approached her. Thanks to her devoted rescuers and the loving new family who adopted her sight unseen, she's now a happy, healthy pup who has even helped her new doggie sister learn to trust. The New York City Police Department rescued Chowda from a Bronx apartment last summer and brought her to the ASPCA's Canine Annex for Recovery & Enrichment, or CARE ward. "She was very nervous and scared when we first met her," Victoria Wells, the ASPCA's senior manager of behavior and training, told The Dodo. "When we introduced her to a neutral dog, that is when she began to show some signs of happiness." By working with Chowda every day, and helping her learn from other, more confident dogs, Wells and the rest of the rescue staff slowly taught her that humans aren't all scary. 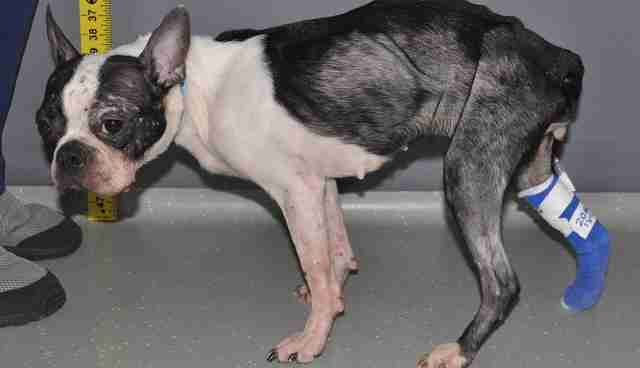 After four months with the ASPCA's special anti-cruelty team, Chowda had become a cheerful, well-fed little dog. "We make it our mission to find out how these dogs are feeling and what's going to change their perception of whatever's scaring them," Wells told The Dodo, adding that they search for "that one thing that flips the switch." Even though Wells has been working with rescues for 17 years, seeing dogs like Chowda transform into the loving, trusting animals they were meant to be still makes her emotional. "Every day is like the first day," she said. "Most of us cry when we see them leave." Meanwhile, in Brooklyn, Diana Andrade and her husband, Chris, were on the lookout for the right rescue dog to join their family. They had adopted their 2-year-old pit bull, Meisha, from the ASPCA a year earlier, and they were hoping to adopt a second, friendly dog who would help bring shy Meisha out of her shell. Though they couldn't meet Chowda because of an ongoing court case surrounding her neglect, Diana and Chris trusted the rescuers who promised she was perfect for them. The day they met Chowda last fall, they knew the rescuers were right. "She was all jumpy and excited to meet us," Andrade told The Dodo. "She's so fun and so loving." Chowda has fit in perfectly with her new family. 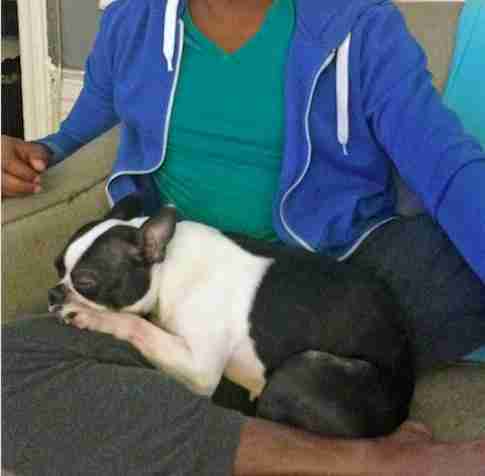 "She just wants to be in someone's lap all the time," Andrade said. "Anytime I get up and go anywhere, she's right on my tail." 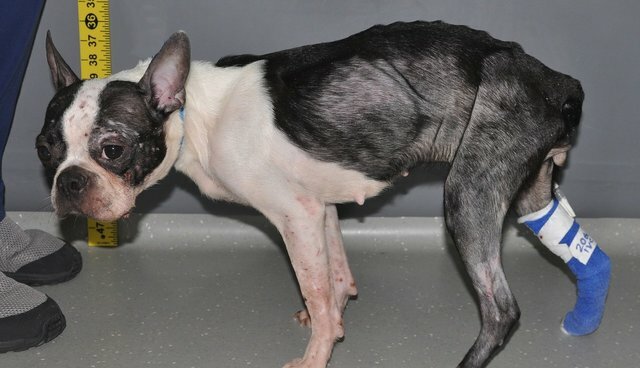 When Andrade first saw the intake photos of Chowda, she couldn't believe her happy little dog had been in such rough shape only months earlier. "That's one of the reasons I love rescue dogs," she told The Dodo. "They're absolutely resilient and loving and forgiving."